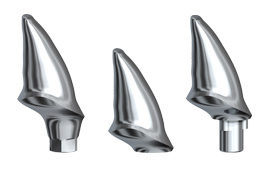 NobelProcera delivers a full range of precision-milled, safe and strong abutments. Grow your business using one system to offer abutments on major implant systems. Further diversify your offering with time-efficient screw-retained crowns for direct veneering. NobelProcera screw-retained solutions consistently offer long-term clinical success and patient satisfaction. NobelProcera Zirconia is the ceramic material of choice for strong and highly esthetic restorations. Frameworks in Zirconia are available for cement- and screw-retained solutions on teeth and implants from single-unit to multi-unit restorations. Zirconia displays excellent biocompatibility with significant reduction of plaque and bacterial adhesion on surfaces. *Zirconia abutments for NobelActive are not indicated for posterior use. NobelProcera Titanium is highly biocompatible and produces excellent soft tissue response. This material represents an excellent alternative in cases where the clinical situation limits the application of Zirconia frameworks. 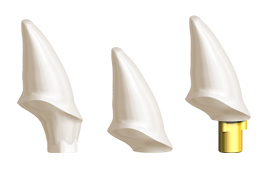 NobelProcera Titanium restorations are milled from a solid monobloc for extraordinary strength and precision of fit. NobelProcera Titanium offers a cost-efficient alternative to casted PFMs for temporary and final prosthetics.